Bhojpuri superstar Pawan Singh has turned a year older today. 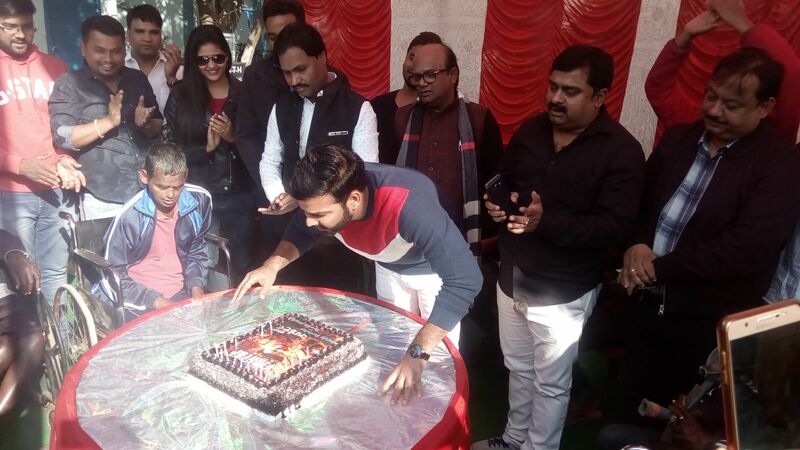 The 33-year-old actor has celebrated his birthday in Ranchi with orphan children. He sang his popular numbers and also dedicated his songs to the children. The actor, who is a big name in the industry said that he never celebrated his birthday but his fans love has made him celebrate the birthday with orphan children. Pawan Singh has a huge fan base and his films and songs go viral instantly on social media. He raised to fame with his popular track ‘Lollipop Lagelu’ which still rules the internet. Pawan Singh is one of the most sought-after stars of the industry, who has delivered many blockbusters. Among his films are Wanted, Sher Singh, Devra Bada Satawela, Bhojpuriya Raja. He has also been awarded the Best Male Singer in the International Bhojpuri Film Awards in 2016. Pawan Singh and Kajal Raghwani’s song Dehiya Jawan Samaan from film Hukumat features their steamy romance. The song is sung by Pawan Singh and Indu Sonali. The music is composed by Avinash Jha. The song has garnered more than 30 million views on YouTube and is still going strong. Bhojpuri superstar Pawan Singh and hot bomb Akshara Singh’s song Locker Me Jawani from the film Maa Tujhe Salaam had become rage on the Internet. he song shot in London is a lively dance number laced with romance. Akshara is donning a beautiful blue short dress whereas, Pawan can be seen in a red and yellow shirt. The song is sung by Pawan Singh and Akshara Singh and is produced by Abhay Sinha and Samir Aftab. Bhojpuri superstar Pawan Singh and hot bomb Mani Bhattacharya’s song Palangiya Sone Na Diya from the film Wanted. In the song, the sizzling chemistry between the on-screen couple Pawan and Mani is taking the Internet on fire. In the video, both are twinning in a yellow outfit and look absolutely stunning. The song has been sung by Pawan Singh and Indu Sonali. Bhojpuri star Pawan Singh’s new Kanvar song titled Bam Chhod Da Chilam has released on YouTube and it is taking the Internet by storm. In the video song, Pawan is grooving to the song while worshipping Lord Shiva. Pawan Singh’s song from his film Maa Tujhe Salam titled Lagaile Baani Boroplus features Bhojpuri actress Madhu Sharma along with Pawan Singh. The foot-tapping number is sung by Pawan and Mohini Pande. The song is written by Sumit Chandravanshi and is composed by Avinash Jha.